The Dankoff Flowlight Booster Pump provides city water pressure anywhere. It has been a standard in home renewable energy systems since 1986. It is economical for domestic water supply, drip irrigation, and water purification. A booster pump is far more cost effective than an elevated tank, providing pressure equivalent to over 100 feet (30 m) of elevation. It uses one third to one half the energy of a conventional AC pump, and eliminates high starting surges. 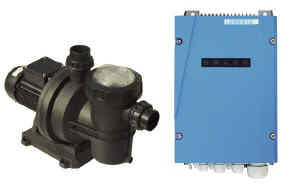 It is more powerful, quieter, and much more durable than plastic RV/Marine pumps. Wearing parts are replaceable, and typically last 5 to 10 years. Overall life expectancy is 15 to 20 years. Our complete instruction manual and easy installation kit make this pump simple for anyone to install and service, with no previous experience. • Subtract 1 ft. for every 1,000 ft. altitude (1 m for every 1,000 m) for both versions. Note: Suction capacity may be further limited by intake pipe friction. • Excessive suction causes cavitation (vapor bubbles) creating noise and excessive wear. Intake piping should be 1” or larger. • Pump should be mounted as close to the water source as possible. • Pump may be mounted horizontally or vertically. • Pump must not be submerged. • It may be placed inside a 6” (120 cm) or larger well casing, suspended by rope.